Early in the morning, at 5:15am, Samuel‘s alarm was ringing. After we have spent the last days cycling, I (Julia) was a bit too tired to get up as well, but Samuel was very motivated to watch the hot air balloons rising in the sky above Göreme at sunrise. Slowly the sun rose and Samuel was waiting excitedly. As far as we knew the hot air balloons should rise very early in the morning because then the wind and thermal conditions are usually most suitable. But as one hour passed without anything happening Samuel started doubting. Another hour later it was too late to go back to sleeping and he finally had to accept that this day there were no hot air balloons starting. Our arrival in Göreme was a bit disappointing at first. Not only did our first attempt at watching the hot air balloons fail but also we had some troubles with Couchsurfing. Our first host sent us to his hostel which of course at first we would have had to pay for, only when we left they said we can stay there for free. Still we declined because this is not really what we are looking for when we use Couchsurfing. After that we tried a second time without success. Although this time our host was very nice and trying very hard to be a good host he was also a bit chaotic and unreliable and finally we ended up looking for a hostel after we had spent one night at his friends’ place. This way we could start anew in Göreme and hoped that we could still enjoy our time there and get some much needed rest. 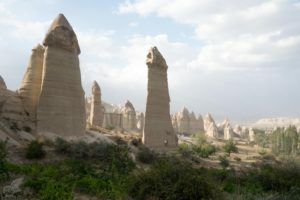 Cappadocia offers many interesting sites to visit and one could easily spend more than a week to explore the whole area. When we were still on our way to Göreme, which is the touristic capital of the region, we visited Kaymakli which has one of countless underground cities. It seems like not only the Phrygians liked to carve their homes out of stone, also in Kaymakli people of different cultures did the same. It was impressive to see what remains of it and to try to imagine how they could succeed at carving out caves, corridors and halls on many layers deep into the earth. Especially Samuel had lots of fun roaming around and exploring the cave system. In Göreme’s open air museum old monastery remains are on display and these are as well carved out of stone, though this time above the ground. Some of the churches bear beautiful and elaborate paintings on the inside. The caves that seemed to once have been the accommodation of the nuns were made in the same style with long tables carved out of the stone in the ground. 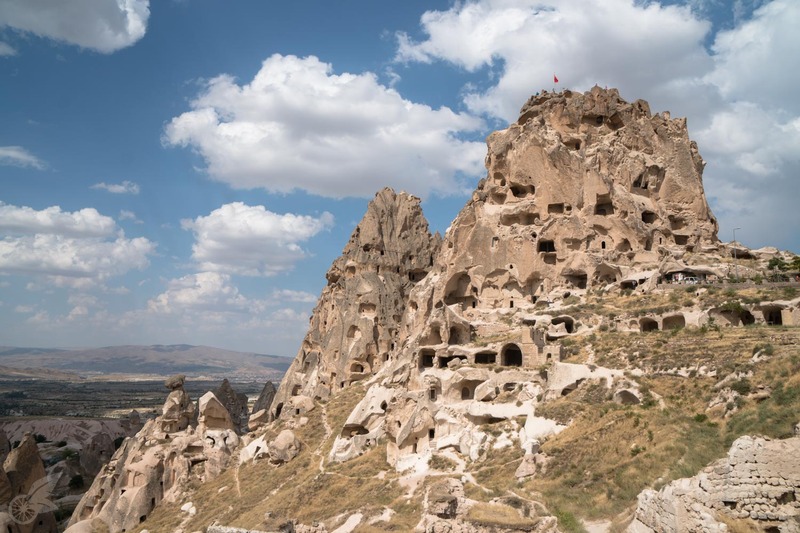 We have visited caves deep underground and above ground and lastly we have visited the fortress in Uçhisar which is a huge, hollowed out rock. Göreme itself was a bit too touristy for our taste. It seems like a big commercial Disneyland fun park with restaurants, cave hotels, hostels and souvenir shops on each and every corner. Only few locals are still living here and they all seem to run a business involved with tourism like the ones mentioned above. We came into contact with some people and one of the most interesting encounters was when we met an Iranian refugee who had to leave his country in order to escape a harsh punishment because he was advocating human and women rights and also openly stated that he was not a muslim anymore. In contrast to that we have met a young Iranian couple in the same place who were spending their holidays there. Most of the time we couldn’t follow the conversation between the three very different representatives of their countries since they were speaking Persian. A bit later we met Sven who decided to leave Germany behind and to travel around the world on his motorcycle as a digital nomad. We enjoyed talking to him about everything under the sun a lot and Sam got to talk shop about photography. 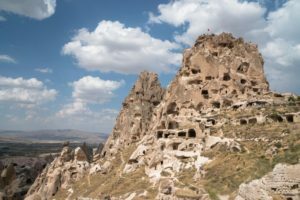 Despite the fascinating conversations we wanted to explore the area around Göreme and thus we spent one day hiking through two of the countless valleys surrounding the village. It did us well to escape the crowds for a while and enjoy the nature instead. In the Love Valley there are impressive rock towers and the name of the valley is obviously hinting at that. But we thought that this is a bit of a single minded understanding of ‚love‘. Samuel couldn’t let the idea of watching the hot air balloons rise go since we have heard time and again how beautiful and impressive it was to witness this spectacle. Thus we decided to spend our last night in Göreme camping in the same spot as our first night before continuing to Malatya. Again the alarm was ringing much too early for our taste and there were strange noises outside. Samuel slowly turned around to have a look out of the tent entrance. And this time they were there: countless hot air balloons rising into the early morning sky.